Here&apos;s a building I&apos;d forgotten about until I ran across the above video clip on YouTube recently: The McCormick Inn, a high-rise convention center hotel that was demolished after only 20 years of use. The silent video, posted by YouTube user firemann57, shows the action around a 1976 two-alarm fire at the hotel, located at 23rd and Lake Shore Drive. Drive. The camera sweeps around a bit, but there are great views of the glassy, black 25-story hotel designed by A. Epstein & Sons as a companion piece to the then-new McCormick Place on the Lake. I&apos;m also digging the clunky fire equipment, the old school green-and-white CTA bus stop sign at 1:22 and the traffic whizzing by on a stretch of 23rd street that--like the hotel--no longer exists. At 1:39 you can see McCormick Place (now Lakeside Center) and the open breezeway that separated the convention center side from Arie Crown Theater. The opening was later closed with a glass wall. The 625-room McCormick Inn opened in 1973 at a cost of $30 million with the Teamsters&apos; Union pension fund covering about $20 million of the construction price. 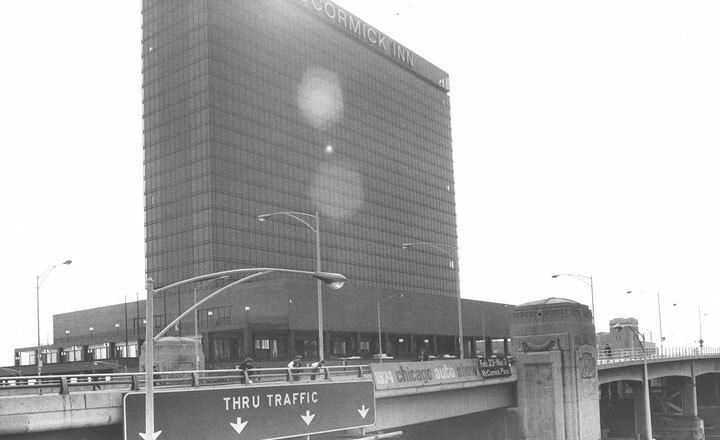 The hotel was demolished in 1993 to make from for McCormick Place&apos;s western expansion — which included a new hotel. The demolition barely made news and didn&apos;t cause a stir along preservationists. Today would be a different story — although the canopy around the base is pretty hideous. Oh — the fire. The blaze was June 7, 1976. An electrical vault below ground caught fire and sent billows of smoke through the hotel. Sixty people were evacuated. A fire lieutenant and a hotel employee suffered smoke inhalation but survived.